Orthopedic Surgery - Country Veterinary Clinic, P.C. Torn ACL Repair--the most common musuloskeletal injury seen in veterinary practice is the torn cranial cruciate ligament (ACL). It is an injury that is also common for humans. This condition is very painful because it causes the stifle (knee) joint to slide back and forth, creating inflammation and causing severe arthritis to form. Many patients are candidates for the MRIT surgery, which can help to offer the pet more comfort and stability and reduce the advancement of arthritis in the joint. It may be performed with some additional procedures that help make the pet more comfortable, such as a meniscectomy and osteophyte debridement. MRIT--an acronym for Modified Retinacular Imbrication Technique. This is an orthopedic procedure used to help stabilize the stifle joint of a patient who has torn their cranial cruciate ligament. During this procedure, damaged tissue is removed from the joint capsule of the damaged knee. Then, the surgeon places stabilizing sutures made of strong material to help keep the knee joint from sliding and causing severe arthritis. Scar tissue will build up around the stabilization sutures, adding additional stability to the knee and reducing the amount of arthritis that may form. Meniscectomy--the knee joint contains fat pads, called menisci. The medial (or inner) meniscus is often damaged when an ACL tear occurs. In this instance, the meniscus needs to be removed at the time the MRIT surgery is performed. Osteophyte Debridement--chronic lameness from a knee injury can lead to arthritis in the joint. Osteophytes are bone spurs that form from long-term damaging inflammation and instability. They are often a source of discomfort for the patient, and may need to be removed during surgery. This is call osteophyte debridement and is a common procedure performed in coordination with the MRIT. Medially Luxating Patella Correction--the term "luxating patella" refers to a kneecap that slides in and out of its groove. There are several procedures, many of which are used together, to stabilize a luxating patella. The most common of these procedures include the Tibial Tubercle Transposition and the Sulcoplasty. Tibial Tubercle Transposition--the patellar ligament (which holds the kneecap in place) is attached to the tibia on the crest-like projection of bone called the tibial tubercle. If the kneecap is sliding medially (or towards the inside of the knee), many surgeons find it helpful to detach this piece of bone and move it into a different position, to pull the kneecap further toward the outside and keep it from slipping inward. Sulcoplasty--the groove that holds the patella in the proper position is called the sulcus. Some patients have a very shallow sulcus, which allows the patella to slip in and out of position. A sulcoplasty is a procedure where this groove is made deeper, to help keep the patella from sliding out. This is done by removing a wedge of bone from the sulcus, filing the underside of the wedge to make it smaller, and then replacing it. Femoral Head Osteotomy--the FHO (femoral head osteotomy) is a surgical procedure used to remove the head (or "ball") of the femur. It may be performed for a few different reasons. Some patients with unilateral (one-sided) hip dysplasia can find some comfort from the procedure, or patients who have certain types of fractures or injuries can also get relief by this method. Fracture Repair--There are many different methods for stabilizing broken bones, including a variety of surgical techniques. For some patients, depending on the type of fracture, we can surgically place pins into the fractured bones to help stabilize them until they heal. These pins may stay in for life, or be removed after the fracture heals, depending on the individual patient. This is a technique that our surgeons can perform in our clinic. Other techniques, such as bone plating and external fixation, may be more suited for some injuries and would require referral to an orthopedic surgeon who uses these techniques. Amputation--surgical amputation is never a choice any owner wants to be faced with for their pet, but in some cases it may be one of the only viable options. 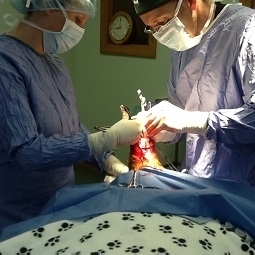 Despite the initial aversion to it, amputation can be a humane and very cost-effective option in situations where a pet would otherwise suffer with an injury or be euthanized. Some types of bone cancer, also, may require us to present amputation as one of the options for a patient. Most types of amputation can be performed by our surgeons and offer a quick recovery period.